I was fortunate enough to be invited along to a private viewing at the Tate Modern with my good buddy Mel. Both he and his wife have memberships entitling them to free entry and +1 which I hope will mean more visits to come. The first being to view the Damien Hirst Retrospective Exhibition. Firstly I had a few preconceptions and had almost determined my feelings about the exhibition before I'd even seen it. This was mostly due to the fact that Damien Hirst's work is often in the media, not to mention often very publicly criticised. I would guess that most people will be aware of a piece of his work albeit some unknowingly. 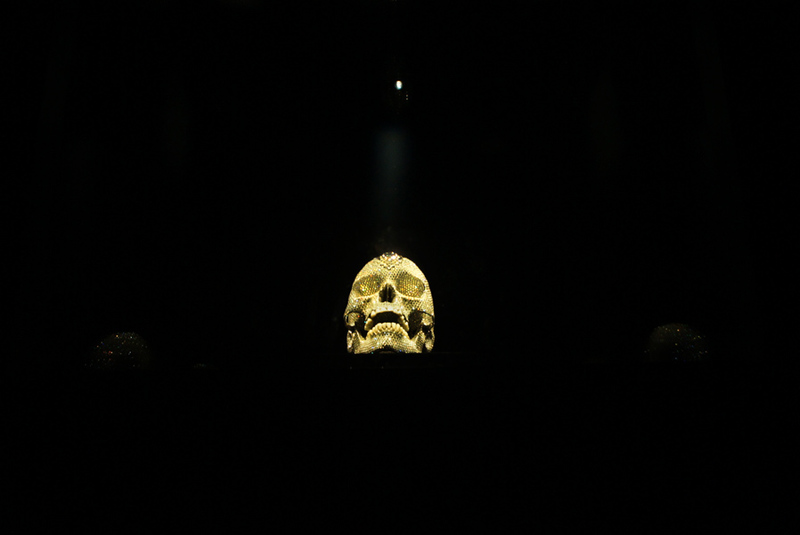 I believe my first experience came about due to his work with skulls. Makes sense right? Upon entering the Tate Modern you're first offering is "For the Love of God". Perhaps better known as the platinum skull covered in 8,601 flawless diamonds including a pear shaped pink diamond in the centre of the forehead. Or if you prefer £50,000,000 of stones and a set of original teeth. We were literally left to stumble down a dark corridor blindly into the pitch black main room, where the skull was being displayed. The only light sources directed down onto it made for a stunning sight. This photo is from J E Z B L O G and you can check out his take on the exhibit by clicking HERE . How he took this photo is a question I'd like asked but again further highlights the fact that no camera in the World can capture the beauty. Only the naked eye can truly experience this wonder. I thought I'd seen the image of the skull far too many times to actually feel anything other than meh, boy was I wrong. Having expected so little I left that chamber in awe, like I'd been privileged to cast my eyes upon the piece. Nothing, no photo, video or description, can accurately capture the rainbow hues given off the diamonds and portrait the ridiculous beauty in its entirety. That in itself is mind blowing, to me at least, though I know purveyors of art can understand where I'm coming from. Like being told upfront "Here is something, only it's far more brilliant seen in person with the human eye." After experiencing this firsthand I was ready to defend Hirst against all the critics and those bemoaning the audacity of the piece. Sure if you give it little to no thought then it's nothing more than a cast of a skull covered in precious jewels possibly better used for something else. But think about it the way Hirst intended and allow your eyes and senses to tell you what you feel. Like I did. I can make a very long list of garish and extortionately priced 'things' that don't offer anyone else but the owner of said item any joy or sense of achievement. Homes, private jets, yachts and even islands. Lamborghini Mercy. No chicks thirsty. Now that I've poured out praise from the word go, let me switch it up. I'm still not a huge fan of Hirst's work overall. I'll touch on just what I considered the main exhibits in this collection. I was moved by the pill wall display with the vast array of colour, sizes, textures and assumed purpose but not the cabinets and pharmaceutical theme in general. Was fun trying to find the uppers and downers, and had a giggle over the vaginal and face creams being side by side in one display. The medical displays and surgical instruments didn't offer me much thought, though some looked very alien. Might have liked seeing part of the collection ravaged by rust maybe. The cigarettes and ash tray, nothing, I'm sorry. Had he placed a group of nicotine addicted zombies clawing at the worktop trying desperately to reach the solitary packet and lighter I might have raised an eyebrow. A giant ashtray stinks, literally and metaphorically. Maybe as a non smoker I missed the point? How this theme can dare sit along side "Doorways to the Kingdom of Heaven" is just unfathomable, unless you perhaps know something about art which I don't seem to. These works in the vein of stained glass windows, made entirely out of butterfly wings (reportedly Damien Hirst bred and cared for the butterflies he used for this work) is almost indescribable. I kind of feel bad for something so beautiful having been made out of butterfly wings. Please don't tell the living ones in the butterfly room what's likely to be in store for them. Which reminds me, I was attacked by a butterfly in that bizarre almost London Zoo type of atmosphere where the public couldn't touch or swat away a homicidal butterfly, but the staff could grab and flick them all they wanted. Strange, I mean did they have special training on how to handle the butterflies that us mere visitors couldn't have hoped to grasp? Nah. As you can see from the above, also in this room was the "Anatomy of Angel" sculpture which was nice but I'd have been as happy to see a life size Kaws Dissected Companion in it's place. The white marble was a nice touch. Skipping the enormous circle mounted on a wall made up entirely of dead flies, but keeping with the animal and insect theme brings me to the severed cow head and room full of flies feasting and breeding. My only thoughts were how far back would you need to go for this to have been considered unacceptable, and how far away are we from artists using human corpses? Sharks and cows in formaldehyde didn't move me, but the dove in flight certainly did and made a great final piece of the exhibit. Now I've not commented on the gloss paint wheels or the spot pictures because I found them forgettable. I know his work with the spots is actually highly acclaimed (for Hirst anyway) but I don't see the art in them. The wall displays of assorted fish entitled "Left" and "Right" we're far more interesting. The wall displays of various shaped and sized diamonds with Gold and Silver backdrops only served to prove that in some ways they are just rocks. At least that is what I took from them. How do we determine what is valuable and precious? And that's about all I can remember. It was a great night with Mel, aren't they all? And I was genuinely pleased to have had the chance to view what I have seen in many articles and editorials in the flesh. Dispute my criticisms I would recommend going if you can. You are not guaranteed to agree with my feelings but you are guaranteed to have feelings. And with that, the Artist has achieved what he set out to accomplish. Hope to be able to see more great artists' work soon with my buddy. Peace.